How do I report issues or bugs? Tap the "Send E-Mail" button. Please provide as much detail as possible in order so our support team can best assist you. Tap the "Submit Review" button and follow the instructions. How could let my friends, family and colleagues know about this app? You can recommend the app on Facebook by tapping the "Recommend on Facebook" button or you can tweet about the app by tapping the "Tweet About It" button. 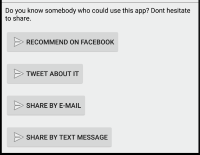 Or you can tap the "Share By E-Mail" or "Share By Text Message" button. Details about the app will be pre-filled into the message. Scroll down to the "Monitor My BP" section. Tap the "Company Website" or "Product Support Website" button for the latest information.